Africa is highly vulnerable to climate and land use change coupled with a growing population and industrialization which is why it is crucial that we prioritise the protection and management of our natural carbon sinks. In order to avoid future, catastrophic, climate change we need to urgently and significantly reduce the content of greenhouse gases in the atmosphere. One of the ways to do this is to manage ecosystems and habitats that act as critical natural carbon sinks, to ensure that they retain as much of the carbon trapped in the system as possible and don’t tend to become sources to the atmosphere. In Africa, we have modified the structure and function of many ecosystems through land use change and land degradation as a result of burning of forests, conversion to croplands, urban areas, mines and roads. This has altered the relationships between the natural carbon sources and sinks of carbon dioxide. Often the release of trapped carbon as carbon dioxide is accompanied by the release of other powerful greenhouse gases such as methane which exacerbates an already concerning global climate situation. Put simply, a carbon sink is anything that absorbs and stores more carbon from the atmosphere than it releases as carbon dioxide. Carbon sources include the burning of fossil fuels like coal, gas and oil for energy and transport and agriculture. Natural carbon sinks include oceans, forests, grasslands and soil. 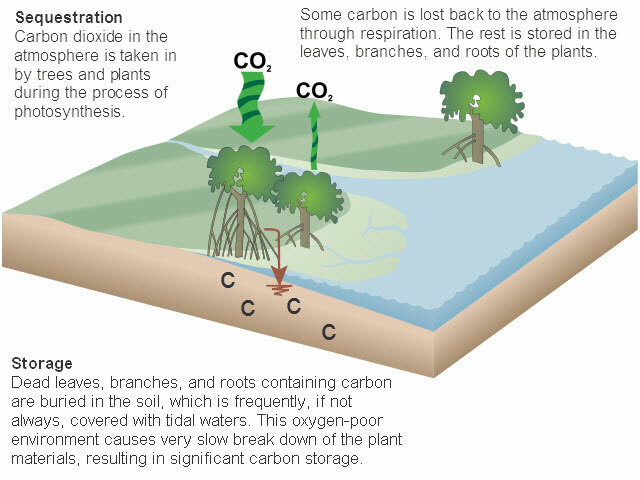 Carbon sequestration is the process of removing and storing carbon from the atmosphere in carbon sinks (such as oceans, forests, grasslands or soils) through physical or biological processes, such as photosynthesis in plants. When the plants die and decompose, some of the carbon is transferred to soil. In the ocean, marine animals also take up the gas for photosynthesis, while some carbon dioxide dissolves in the seawater. In order for these sinks to absorb the greenhouse gas emissions, we need to protect and manage our natural carbon sinks. Management is key to determining whether they can act as a source of CO2 to the atmosphere or a sink under future climates. Biochar production and application in order to create a carbon-rich material that can be mixed into soils to increase soil-carbon. Reduced emissions from Degradation and Deforestation (REDD+) through planning and regulation. While protection and management of carbon sinks is important, it is equally important to continue reducing our anthropogenic emissions of greenhouse gases through reducing fossil fuel emissions to zero. Read our full position paper here.